The fact-finding mission that recently visited the northeast of Brazil has concluded its mission with a series of public hearings and high-level meetings in Bom Jesus, Teresina and Brasilia. Presenting some preliminary recommendations, the delegation urged Brazilian authorities to take immediate action to improve the living conditions of affected communities and to take measures to counter irregularities with land titling in the region. 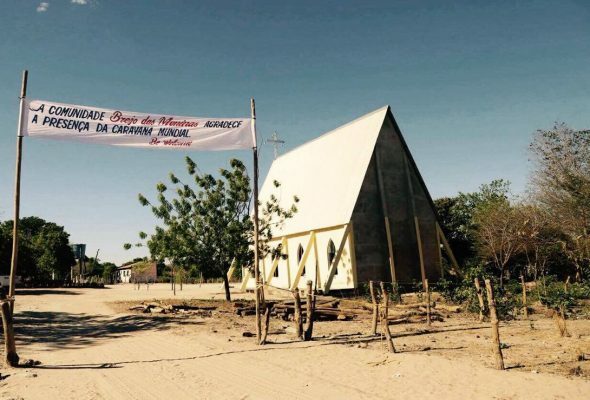 During its twelve-day fact-finding mission in the south of the state of Piauí, the delegation witnessed the gravity of structural violence against the communities, whose lands are grabbed by ‘grileiros’. The latter abuse agrarian cadasters to falsify titles and sell the newly acquired land to the agribusiness companies in the area. As a result, villagers have to face threats, destruction of homes, loss of livelihoods, pesticide contamination, health problems and dwindling water supplies, as well as the prospect of legal action. In the hearings, the delegation elaborated on these observations and presented some additional data. While most officials the team met are not foreseen to take any action, the public defender has expressed a great interest in investigating the case and intends to hold a public hearing in the community of Santa Filomena in November. For their part, companies involved were invited for reaction but none attended. Caravana Matopiba also touched upon the contested role of international capital in large-scale land acquisition. Since the financial crisis in 2008, land and agribusiness are increasingly seen as comparatively safe sectors to invest in. Important actors in this field are pension funds, which are obliged by national law to grow their capital to secure future retirement payments. Currently, pension funds are investing over 32 trillion USD worldwide, including the region visited by the fact-finding mission. Previous research shows that TIAA-CREF, a US pension fund with capital of approximately 1 trillion USD, is operating in the Matopiba region through a sub-substitute company called Radar. Under the guise of a complex structure, the company circumvents the Brazilian law that prohibits foreign investments above a certain scale. TIAA-CREF receives investments from pension funds in Canada, Germany, the Netherlands and Sweden, amongst other countries. National governments are only monitoring the financial risks of these investments, but are disregarding the potential human costs, even though they have the responsibility to protect human rights within and beyond their borders. The delegation will continue to investigate and expose the problematic nature of these investments over the following months. For this purpose, a follow-up fact-finding mission will be carried out early next year in Europe. The aim is to shed light on the involvement of European investment in large-scale acquisitions in the Matopiba region, as well as the inaction of European States thereon. It is already abundantly clear however, that pension funds must stop investing in the region, and that States need to regulate the pension funds based within their national borders. It is the Brazilian State that is ultimately responsible for putting an end to this practice, which is not only characteristic of this region, but of the country as a whole. On this note, the delegation is considering the possibility to request a precautionary measure by the Inter-American Court of Human Rights. The final report of the fact-finding mission will be published by the end of 2017. You can find the preliminary recommendations here (pdf). The fact finding mission, organized by FIAN International and Rede Social de Justiça e Direitos Humanos, FIAN Brazil and Comissão Pastoral da Terra (CPT) Piauí, counts with the participation of: Action Aid International and Brazil, Aidenvironment; Cáritas Regional do Piauí; CPT Nacional; Escola de Formação Paulo de Tarso (EFPT – PI); Federação dos Agricultores Familiares (FAF); Federação dos Trabalhadores Rurais na Agricultura (FETAG-PI); GRAIN; HEKS/EPER International Institute of Social Studies; La Via Campesina International and CLOC- La Via Campesina Brasil, Maryknoll, Paróquia de Santa Filomena, Instituto Comradio do Brasil; Obra Kolping Piauí; Sindicato dos Trabalhadores Rurais de Santa Filomena; Vara e Procuradoria Agrária – PI, PROGEIA (Santa Filomena), as well as FIAN International’s sections in Germany, Netherlands and Sweden.